Big deal. Blah, blah, blah you and your wife like wine, so does half the world. You like it so much, you went to Napa. Yeah, what dedication, I’m sure it was a real struggle. OK, I get it. My prelude really doesn’t depict me as a starving artist trying to perfect my winemaking craft, but I had to start somewhere, no? A few weeks after we returned from Napa, me and my lady friend decided to stock up on a little Caymus at my local package store. By the way, we don’t call it package stores in these parts of the woods. A package store for me generally has a big eagle on it, is painted brown, or sounds like a government sponsored laxative (Fed Ex if I’m going too quick for you). Oh yeah, where was I….Caymus, that’s right. We went to go buy some proper vino, and in the same building as the liquor store (that’s what we call it) we saw a teeny tiny sign for California Wine Works. This piqued our interest and we had to go investigate. 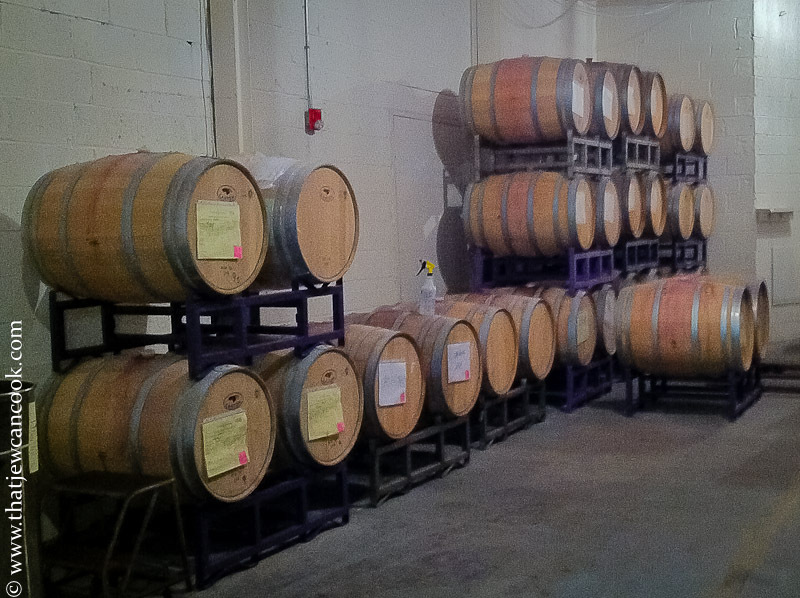 A peek inside the wine “cave”. A few weeks later, our grapes came in and it was time to start. First, we picked our yeast blend and then it was time to de-stem. For the yeast, we had a choice of about 8 different types and to be honest we just picked something that sounded it would yield bold results. At the time, I wasn’t paying too much attention as to which yeast did what, or what some of the other additives were. 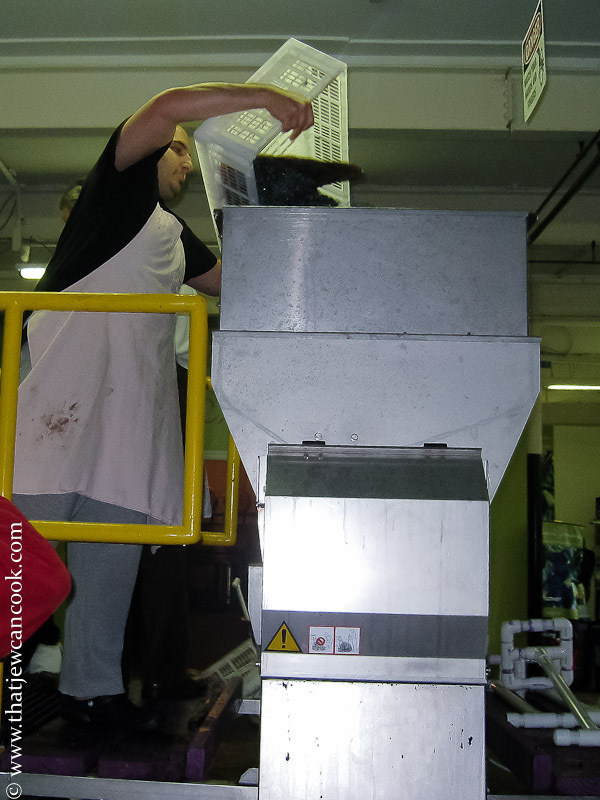 All I know is we dumped grapes into the de-stemmer and ensured all our limbs and fingers were accounted for. The de-stemmer looks like it would have taken care of Jimmy Hoffa pretty well. There is nothing like a good dump. After de-stemming, we added our yeasts and stirred things up a bit with a big PVC type of paddle. This started to introduce a little juice, but generally took a bit of muscling to get through the grapes. Row, row, row your hooch. Once stirred up, the yeasts get to do their thing for a week to ten days. 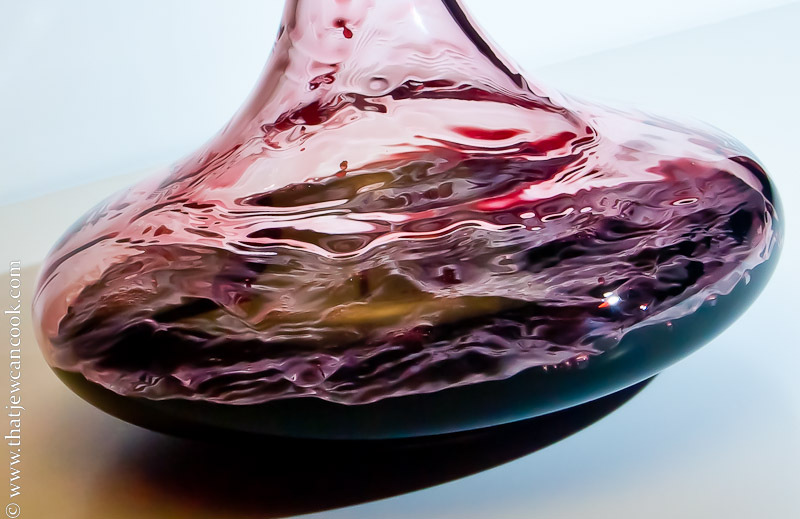 During this time, the top of the wine (at this stage its called “must”) gets a foamy skin and needs to be stirred up pretty often. Often, meaning several times a day, and this is done by the good people of the wine works. If you stop by you can catch them and help, but it’s a bit tough with my commuting schedule. After this has gone on for a bit, its ready to be pressed. Pressing was done with a water filled bladder press, and was pretty easy. Once pressed, it goes right into the barrel and sits fermenting a bit more while waiting for me to drink for up to a year. 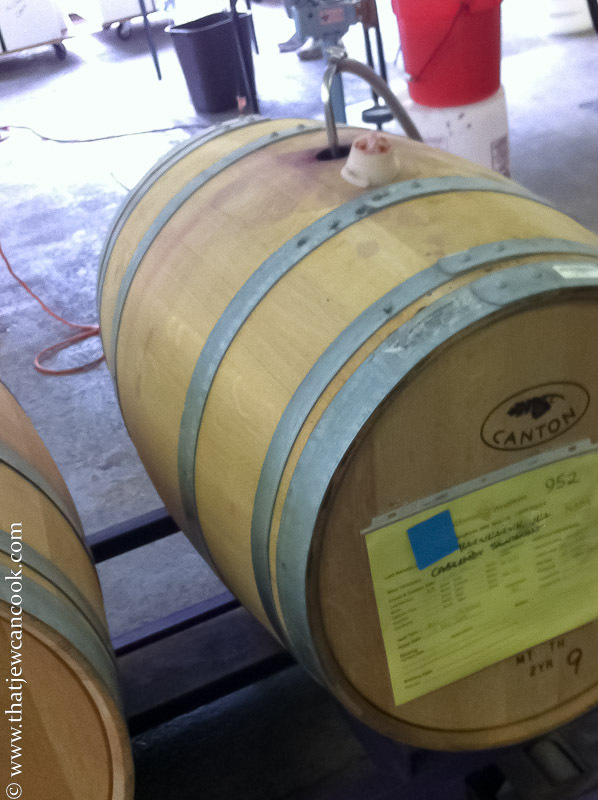 During that year, when the fermentation is complete a process called “racking” is performed to help remove dead yeast and sediment from the wine. Since, I completely missed this part, I’ll discuss the racking process in a subsequent post. After a year or so, my little barrel friend was ready to get pumped into the bottles. The bottles needed to be cleaned, drip dried and then filled. 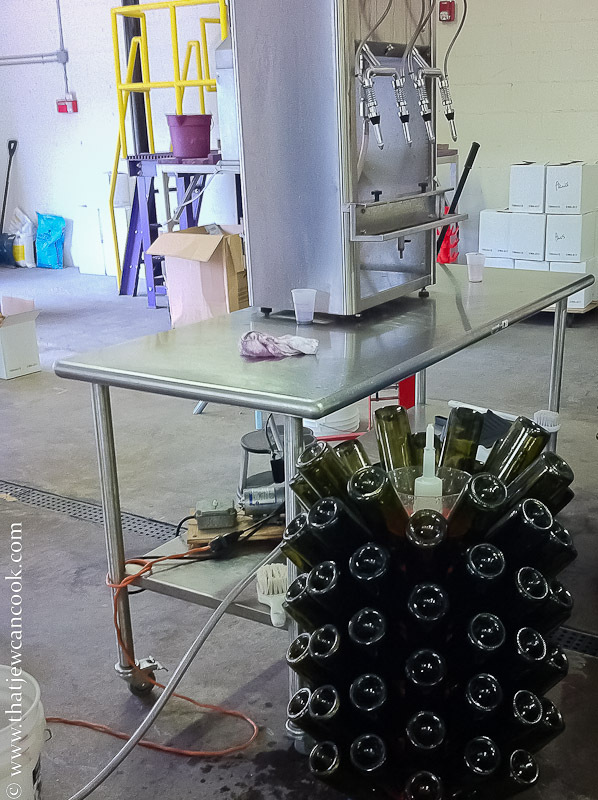 We used a gravity filler to load up 4 bottles at a time. 2 people filled, and two people corked. After a few hours of this process, I loaded 5 cases of Napa Cab into my car. This is what a Christmas tree looks like in Andy’s world. So, how did it taste? Considering its age, pretty damn good. Big, fruity and oaky, but the oak is starting to mellow out a bit as it sits. These guys are making serious wine, with good grapes and a deep knowledge to back it. We are really pleased with the results and in the past 2 months, we mowed through a case and a half (many of which we gave away, we aren’t complete lushes.). Over time it will change more in the bottle, we’ll have to taste one every couple of months. Am I a winemaker yet? Unfortunately, no, not really. It was a great deal of fun and all, and I really got into the process, but I still don’t know how to make wine. I do know many of the steps involved, but the serious winemakers at the club did most of the real artistry and work. Was it worth it? Absolutely! We loved it, and signed up for another 1/4 barrel this year and highly recommend it to our friends. By the way, our wine is called “The Moops”. For any fellow Seinfeld fans, you’ll get it. If not, go watch some Seinfeld will ya? In Colorado we have liquor stores. 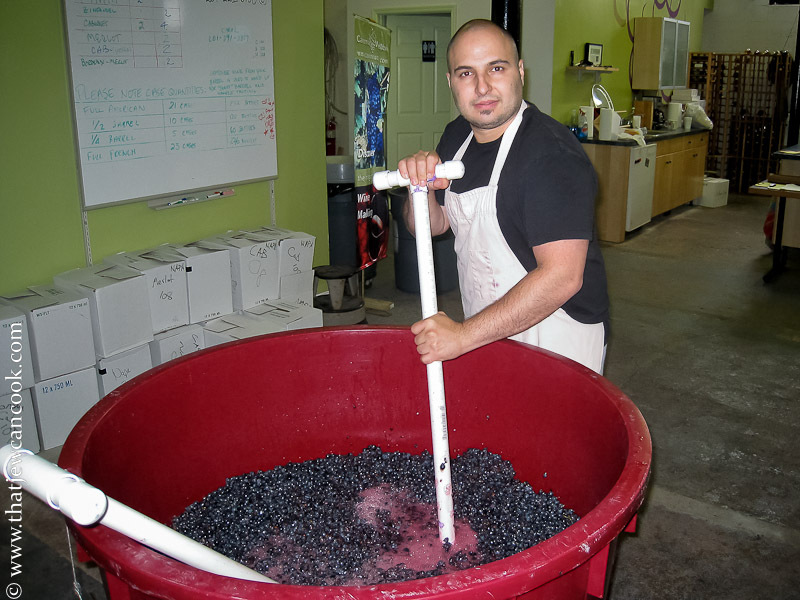 We also have a wine making facility very close to home. I’ve threatened to do it. Tha is some gorgeous make your own wine place. Absolutely wonderful – and massive. That looked like a LOT of fun. I would definitely have a wine making party there – great for a stag or staggette.